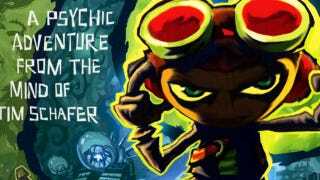 Having been the property of companies like THQ and Majesco, the publishing rights to cult platformer Psychonauts are now back where they belong: with Double Fine, the people who actually made the game. That's according to a slightly premature tweet from a Double Fine employee, at any rate, who after dropping the info says that a more official announcement is coming. What this means is that, unlike every copy sold until now (from which a large cut of the proceeds went to a publisher), from here on every copy of Psychonauts sold will see most of that money go back to Double Fine. So they can keep on making games like Psychonauts, Costume Quest and Brutal Legend. This isn't a common situation for a (relatively) major developer to find themselves in, so if you feel like supporting the team and playing one of the better (and funnier) platformers of the last decade, you can get the game on Steam and Xbox Live's Game Marketplace.